*New* Conditional Buff - Electrified for 2 rounds - Applies Electrified to any allies that have Protective Shroud. Electrified deals Electricity damage to enemies when attacked and can trigger Static Charge. Grants Concealment to all allies for 2 rounds (Concealment grants a chance to avoid single-target attacks). *New* Grants Elemental Mastery to Storm. Elemental Mastery increases Storm’s elemental damage and unlocks additional offensive benefits on Storm’s attacks. *New* Weather Witch - Allies with Protective Shroud take 50% less Fire, Ice, Lightning, and Water damage. 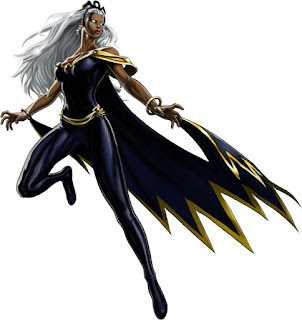 While Storm has Elemental Mastery, has a chance to strike attacking enemies with lightning. Defensive Team - Shroud, Blizzard, then Tornado to reapply Shroud. Can just do Shroud -> Tornado if you're really worried about protect abilities. Wind Wall is a permanent buff so it'll mitigate a good chunk of damage. Gadgets like Quantum Jumper (from Cash Shop after level 60) and Magnetic Field Generator (from Magneto Epic Boss) can get Storm set up faster.